Rarely am I afforded a whole day to play in the kitchen, but I recently found some time to do just that. 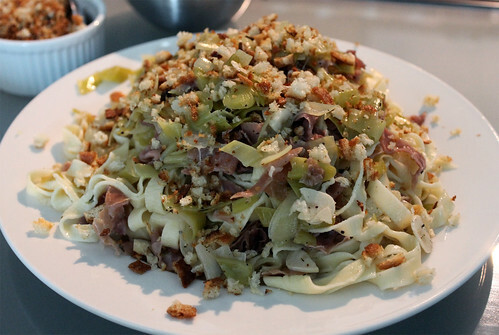 A friend and I occasionally like to get together for a cooking day, where we peruse through our respective, hefty cookbook collections and come up with a multi-course meal to cook and enjoy. With beautiful produce starting to make their appearances at our local farmer's markets, we decided to go for a vegetable-heavy, Italian-inspired menu, keeping the meal light and fresh. 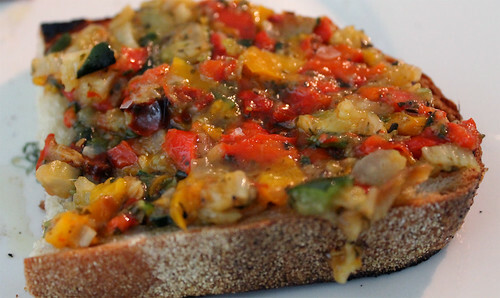 Our starter—a simple but beautiful Mixed Roasted Vegetable Bruschette, a recipe from Jamie Oliver's Jamie's Italy. 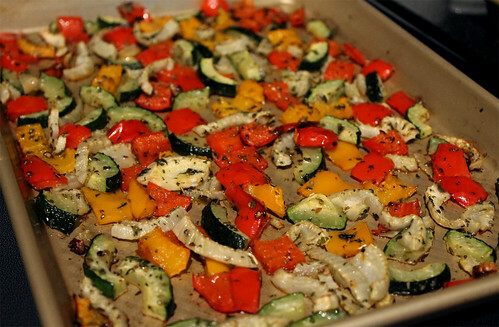 I'm a fan of Jamie's easy-going and no-fuss cooking style, and this recipe certainly didn't disappoint. The gorgeous colours—reds, yellows, and greens from the sweet peppers, zucchini and fennel, make this an irresistible looking dish when served at the table. Our homemade herb vinaigrette, made from steeping some tarragon and chives with white wine vinegar, added a lovely bright acidity to the vegetable mixture, and made for the perfect topping on crispy grilled bread. 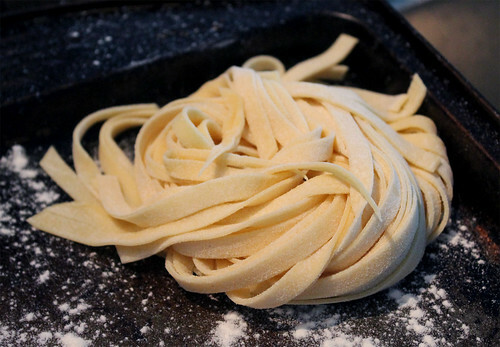 My friend had bought a pasta maker attachment for her KitchenAid Stand Mixer a few months back, but still hadn't taken it out of the box, so I had suggested we make fresh egg pasta so that she could have a chance to play with her new attachment. 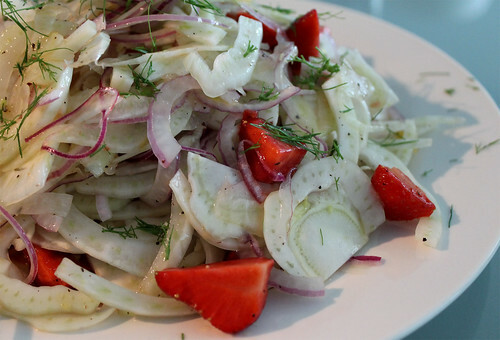 A simple, thinly shaved Fennel Salad, inspired by a recipe in David Rocco's Made in Italy, with ripe, in-season Ontario strawberries, was served on the side. The meal ended with an epic dessert. 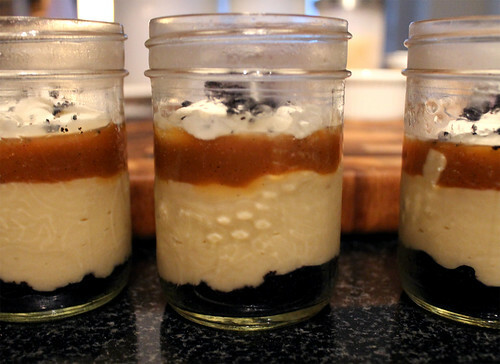 When I first saw the recipe for Caramel Budino with Salted Caramel Sauce in the September 2011 issue of Bon Appetit (courtesy of Barbuzzo in Philadelphia), I knew I just had to make it some day. Salted caramel combined with the silky smoothness of pudding? Perfection! Serve these in a clear glass or a small mason jars to make the most of the layered beauty of this dessert—chocolate cookie crumbs at the bottom, topped with a caramel pudding, salted caramel sauce, and a dollop of softly whipped cream. The perfect ending to the perfect meal! 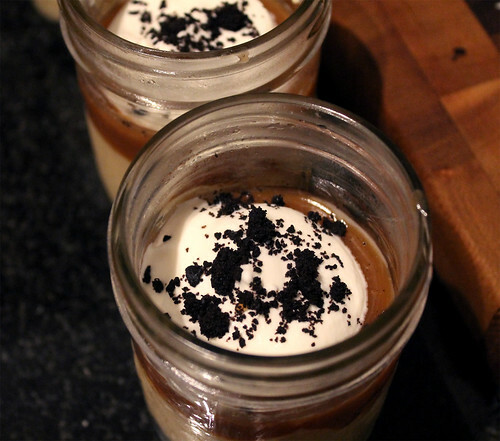 Find the recipe for Caramel Budino with Salted Caramel Sauce here. Tonya - What's On My Plate June 19, 2012 at 9:37 a.m.